Let me begin with the written content in the Reformation Study Bible (2015 edition, ESV). The essence and flavor that arises out of this study bible are not only reflective of the Reformation era, but it is also clearly Reformed in theology and doctrine. The study notes (or apparatus on the bottom), the introductions for each of the biblical books, the theological notes weaved throughout the study bible, and the topical articles placed at the end of the bible, are all beautifully set. From cover to cover, I can say that the RSB is an attractive bible. The symbol of the burning bush stands out and makes a statement. Some of the theological notes are from the General Editor, Dr. R.C. Sproul, who is a passionate and effective teacher in the Reformed tradition (and from whom I’ve learned much from via audio/video/books). The contributors to the RSB (2015) are respected theologians. 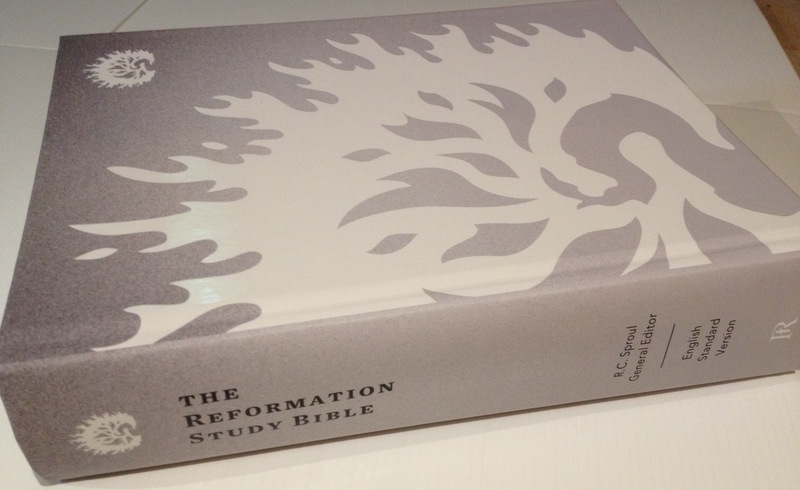 The editors: Associate, Old Testament, and New Testament and contributors have made a great effort in making the Reformation Study Bible a success. I think it’ll make a lasting impression and will be a go-to bible for this generation of Reformed-minded students of the Word. Another example: under “Effectual Calling” (otherwise known as irresistible grace) states: “Before the inward effectual call of God is received, no person is inclined to come to Him… We see, then, that faith itself is a gift from God, having been given in the effectual call of the Holy Spirit…. Effectual calling is irresistible in the sense that God sovereignly brings about its desired result” (p.2146). The study notes (or apparatus at the bottom of the pages) are plentiful. I like how the study notes are interlinked to the theological notes. For example, the note for Rom. 3:23 links to the theological note on “Human Depravity”; and the note for Rom. 3:29 links to the theological note on “Predestination”. This makes it useful for the reader to locate expanded thoughts for deeper theological reflection. Regarding the apparatus/study notes, much of it were from previous editions of the Reformation and Geneva study bibles. There are some updates and additions (however, I cannot compare because I don’t have previous editions). This 2015 edition has over 1.1 million words in commentary, which has increased from the 760,000 words from the previous 2005 edition. In the book introductions, what I personally find interesting to read in particular are literary features, Christ’s salvation, and special issues. Book introductions in study bibles these days are a quicker-fix reference than the long-reads of biblical commentaries (It’s good for lay-people, but for pastors, it’s never a replacement for updated biblical commentaries). The color-filled maps are very good. It’s printed on high-gloss paper and is very attractive. The cross-references in the margins are located a little too close to the inner margins in-between the pages. You’ll need a magnifying glass if you want to read it. The narrower cross-reference margins leaves more room for the biblical text though so it might have been a give-and-take decision. It’s a minor issue for me though. Personally, I don’t use the cross-references much anyway. First on the ESV translation. 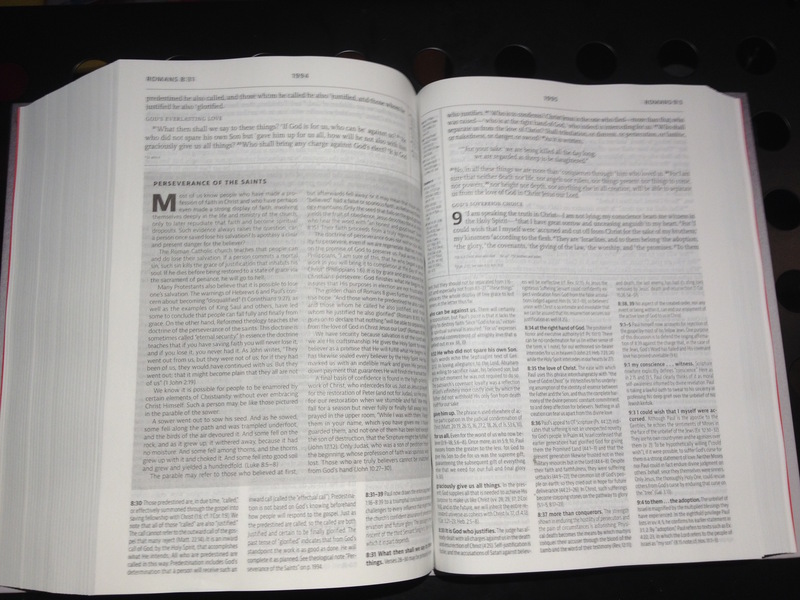 The ESV has become a very popular translation in the last ten years, and will rival the NIV. Reformed and Calvinist evangelicals tend to flock to the ESV, and I think it’ll be here to stay for at least the next generation of bible readers. It will also come out in the NKJV later in the fall of 2015. If I may put this idea out there… just a thought: if Reformation Trust and Ligonier should desires to expand its influence, then why not also include the NIV, NLT and NASB translations? Including readers of other translations will also expand the readership of the RSB. I believe Christians need more access to solid, historic, Evangelical theology. Much of today’s evangelicals have access to fluff, and not enough substance. Good commentary can strengthen traditional Evangelical theology in the minds and hearts of its readers. Now onto some of the physical aspects. When I took the Reformation Study Bible out of the box, I flipped through many of its pages just to take in the all-around aesthetics of it. I like how the layout appears on the page. I examined the binding and it is definitely Smyth-sewn because it allows you to lay it down flat on the table (unlike cheap glued bindings which don’t allow for this). Also, when you look down the top or bottom of the binding, you can notice the separation of sections of paper. If the pages were only held together by glue, you would not notice any separation of sections. So this Smyth-sewn pages is a good thing because it’ll be more durable. Moreover, it is also glued for extra strength. I have hardcover so I cannot comment on how the leather is, but it does feel like a sturdy bible that will last. Most bibles produced today only use cheap glued-binding but this one will be much longer-lasting. I have to say that this was a good job on this one. I wouldn’t buy a study bible without Smyth-binding, especially with it being over 2,560 pages thick (which is now expanded from the previous edition of 1,968 pages). The font size good for me. It might even be a little bigger than some other study bibles, it doesn’t seem as readable. Perhaps this is due to the contrast of ink-on-the-page. However, I do see a few places that could be improved for future batches off the press. From a contrast level, the ink could be kicked-up a notch or two. I pulled out six other study bibles just to compare the ink contrast-on-page, and this one had the least contrast. What is most legible are the chapter numbers. The bible paper itself feels thinner than other study bibles. It has about 2550 pages. The paper is not as crisp as the ESV Study Bible’s so it took me more time and care to turn each of the pages. If the ink was any darker, it might bleed through to the other side of the pages. The print itself is definitely on the lighter side, but for my eyes it’s sufficient. Having a desk lamp near to it will definitely help. This is a study bible that would appeal to many Calvinist-minded and covenant-minded readers and those who desire the traditional evangelical perspective. It will be loved by Reformed-minded and evangelical Presbyterians. I really like this edition. The caliber of this study bible is very good. 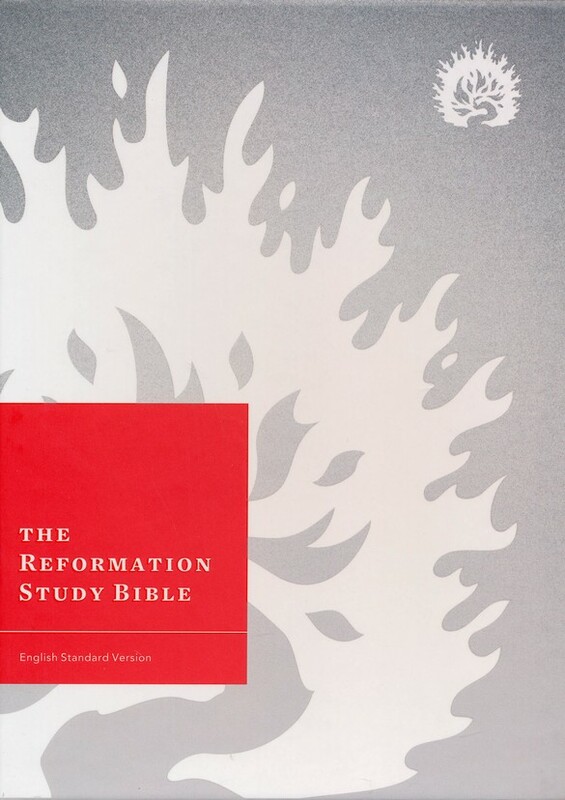 I would say the Reformation Study Bible (2015 ed., ESV) is up there along with the ESV Study Bible and Concordia’s Lutheran Study Bible (ESV) as my top-three personal choice. Good job on the Reformation Study Bible. Thanks to Ashley G. at Reformation Trust Publishing for sending me a copy for review.